Take exit 116 “Mount Carmel/Minersville”. Follow Route 901 (Mount Carmel exit) approximately 6 miles to the small town of Marion, PA. Cross intersection after going down Merrian Mt. Go several blocks to Hickory St and make a left onto 2nd St. (Note: the distance between I-81 to Mt Carmel is approximately 9 miles.) Follow 2nd St several blocks to North Willow St. Make a right one block up North Willow and the Church is located at the corner of North Willow and West Ave.
Services are in all English with a little Church Slavonic on Feast Days. Confessions are heard one half hour before services. Confessions are heard Sunday morning upon request, if possible. Please call the rectory and leave a message to schedule confessions. Those not members of St Michael’s asking for confessions are asked to obtain permission from their pastor; verbal permission will be sufficient. Pentecost Sunday Parastas and blessing of Graves schedule varies and those interested are to leave a message at the rectory and someone will get back to them. The cemetery is located on “Merrian Mt”. 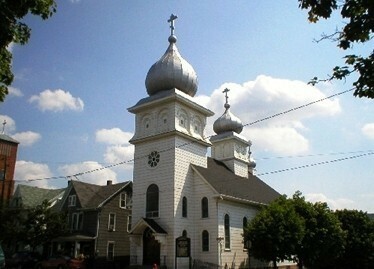 In 1906, a group of Russian-speaking immigrants in the vicinity of Mount Carmel, PA felt the need for a place to worship Our Lord. A Brotherhood dedicated to St Michael was organized and contacted the Chancery in New York about building a house of worship. In 1907, with the blessing of the hierarchs, construction of St Michael Church began. The building was completed the following year. With the assistance from local businessmen and reassurance from the community, St Michael’s began a sound basis by forming organizations, a church school, and a choir. In 1917, the financial situation became critical, but under the spiritual guidance of its pastors, with free-will contributions from the faithful and the support of the hierarchy, the parish soon overcame its difficulties. In 1922 the church interior was remodeled with icons on the ceilings and walls by the artist V Rozedelski. The icons were restored at a later date by a local artist, George McFee. Since 1922, St Michael’s has prospered due to the efforts of the Right Reverend Andrew P Dedick, a pastor greatly admired for his spiritual leadership. Today, many older parishioners still speak of his example and wisdom for the building up of the Faith at St Michael’s. Father Dedick became pastor in 1938, and like many of his predecessors, he became quite active in the growth of St Michael’s. Fr Andrew Dedick is the only clergyman buried at our St Michael’s Orthodox Parish Cemetary located on Merrian Mountain. Matushka Anna Dedick is also buried next to her husband located directly below the foot of the cemetery cross. In July, 1988, a contract was awarded to Michael Kurtz and Son Construction to refinish the entire church. The following year, a contract was awarded to Rudolph N Rohn Liturgical Designers to write 44 icons in soft Byzantine style, Other icons were later added by Chris Mathias, a parishoner, and Mark Sassani. An icon of Ss Peter and Paul was also dedicated in honor of Ss Peter and Paul Church, Centralia, PA, which was forced to close in 1985 because of mine fires. The blessing of the new icons took place in September 28, 1991. His Grace, the Right Reverend Bishop Herman presided together with area clergy. Shortly after the new icons were blessed, Ss Peter and Paul Ukrainian Catholic Church in Mt Carmel, a short block away from St Michael’s, was destroyed by fire. Our parish gave our old iconostasis icons to the parish to use in their temporary location. Their new church has since been dedicated and the icons continue to be venerated. In July 1995, St Michael’s domes were painted and now sparkle and shimmer with renewed vigor. It was the first time the domes were painted since they were erected in 1958, the parish’s Golden Anniversary year. St Michael’s is made up of 93 adult and 6 children parishioners and, while a small parish, it remains very active in community projects. We strive to be a good exampe to the community and we have supported numerous charitable causes for many years, including the victims of a Union National Bank fire which left many people homeless. We pray that we will continue our efforts to proclaim the Holy Gospel of Our Lord in our surrounding area in this and future generations.